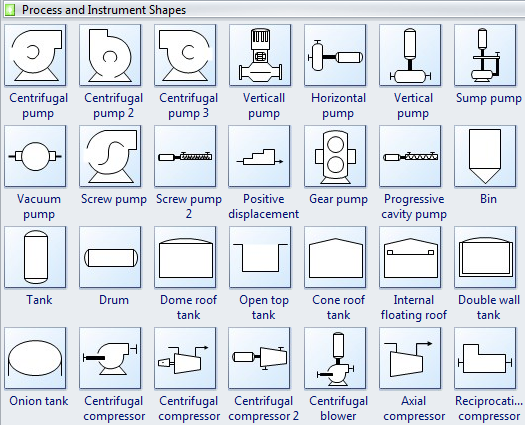 Process and Instrumentation Diagrams use special shapes to represent different types of equipments, valves, instruments and pipelines. Discover why Edraw is an awesome choice for P&ID Software: Try it FREE. A process and instrumentation drawing is more complex than process flow diagram. 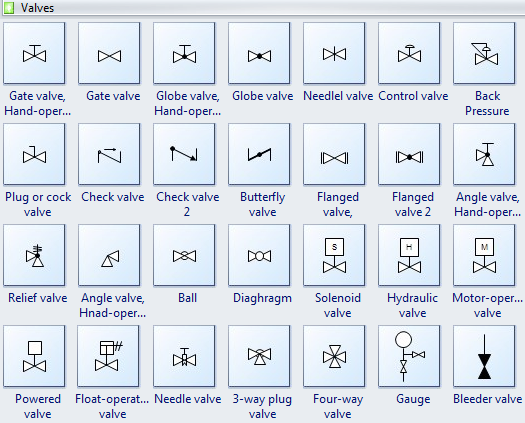 Edraw includes more than 2000 vector P&ID symbols used to depict mechanical equipment, piping, piping components, valves, equipment drivers and instrumentation and controls. 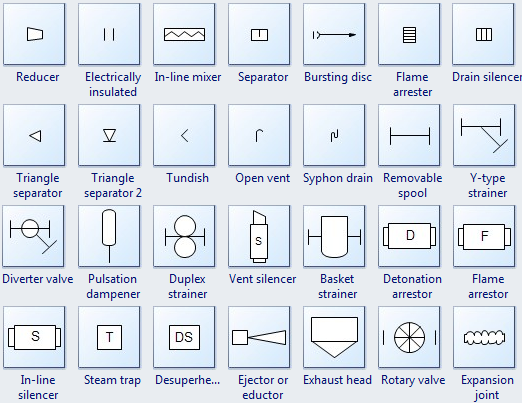 Get the most comprehensive collection of P&ID symbols from our pre-defined library. 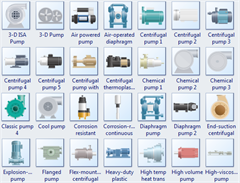 Pumps and tanks come in a variety of designs and shapes. You have both abstract symbols and simulation images to choose. Learn the basic knowledge about piping and instrumentation diagram. Pump is a mechanical device using suction or pressure to raise or move liquids, compress gases, or force air into inflatable objects such as tires. 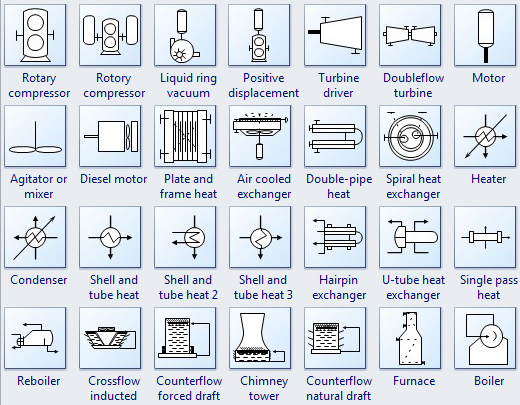 The symbols for pumps may closely resemble those for compressors. Centrifugal pump is rotodynamic pump that uses a revolving impeller to add to the force and pressure of fluids. Gear pump provides continuous, non-pulsing flow making it ideal in chemical installations. Sump pump is widely used to remove accumulated water from a sump pit or other location. Vacuum pump is applied to improve the efficiency of steam heating systems in many ways. The most important consideration is the rapid and efficient removal. Screw pump is the Archimedes screw pump that is still used in irrigation and agricultural applications. 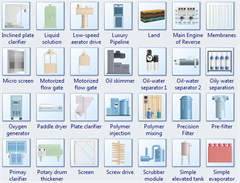 Tank is for storing process fluids of various types, under different process conditions. Onion tank refers to an open top collapsible bladder designed for use as a mobile storage solution when recovering contaminants. Compressor is a mechanical device that takes in a medium and compresses it to a smaller volume. A mechanical or electrical drive is typically connected to a pump that is used to compress the medium. Axial compressor is widely used in gas turbines, such as jet engines, high speed ship engines and small scale power stations. Reciprocation compressor is typically used where high compression ratios are required per stage without high flow rates, and the process fluid is relatively dry. Rotary compressor is a type of gas compressor which uses a rotary type positive displacement mechanism. Mixing is a device that combine or put some materials together to form one substance or mass. Mixing vessel is a container that is used to blend several components together. Heat exchanger is a device used to transfer heat energy between two process flows. Heat exchangers transfer heat energy through conductive and convective heat transfer. Cooling towers transfer heat energy to the outside air through the principle of evaporation. Cooler is a device, container or room that cools air through the evaporation of water or keeps air cool. Turbine driver is used to drive pumps and fans at petrochemical plants. Furnace is a device for heating a continuous current of air by means of a fire contained within the apparatus and without mingling the fresh air with the products of combustion. Boiler is a closed vessel in which water or other fluid is heated. Oil burner is engineered from the ground up exclusively to burn waste oils. Automatic stoker is applied to supply hot water to central heating systems. Plate tower is used extensively in many processes and industrial applications. 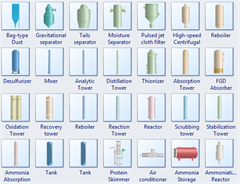 Packed tower is a type of packed bed used to perform separation processes. Elevator is used to control the position of the nose of the aircraft and the angle of attack of the wing. Mixing reactor is widely used in the chemical industry to promote mixing. Gate valve is a device used to control the flow of liquids and gases. Check valve, also known as one-way valve, is to prevent the line of medium back. Globe valve is a mechanism used to control or stop the flow of liquid or gas through a pipe. Ball valve is a valve with a spherical disc, the part of the valve which controls the flow through it. Butterfly valve is installed between two flanges using a separate set of bolts for each flange. Angle valve is oriented at an angle of 90 deg of gate valve. 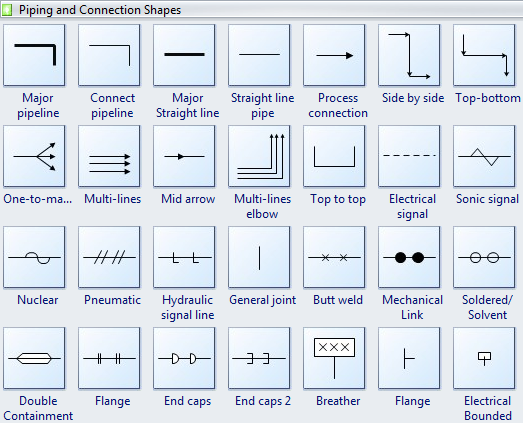 All lines to be fine in relation to process piping lines. Major pipeline is used to connect the equipment in any position. Major straight line is used to connect the equipment in the same horizontal or vertical position. Process connection help to create the process flow between equipments. Double click process connection to edit description. Process Flow Diagram use symbols and circles to represent each instrument and how they are inter-connected in the process. 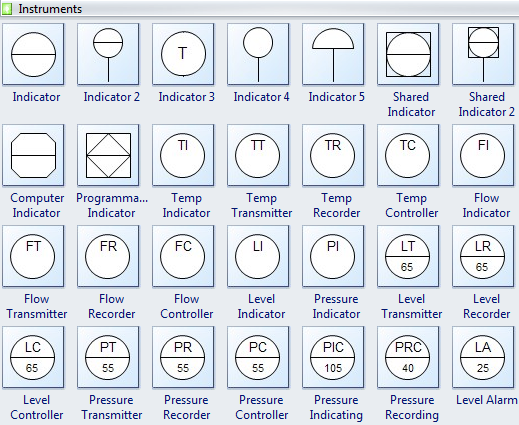 These instrumentation symbols can easily change in types by clicking the quick action button while designing. With large pre-drawn examples and more than 8500 symbols, drawing couldn't be easier! 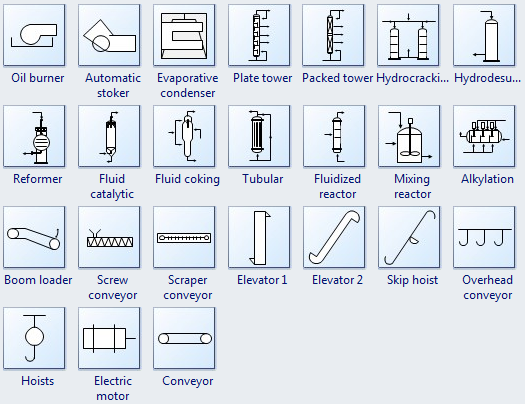 Click here to learn more about Process and Instrument Diagram Symbols. P&ID Designer includes lots of lifelike images enabling presentation-quality diagrams. 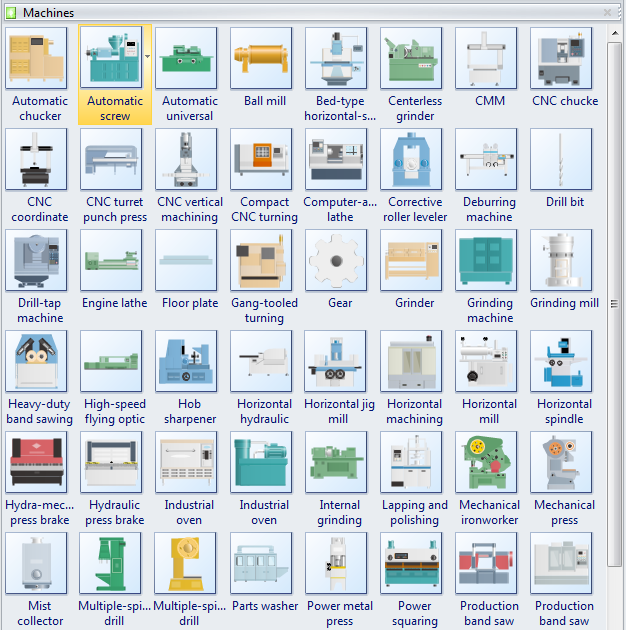 View manufacturing flow chart symbols. See What is a P&ID?